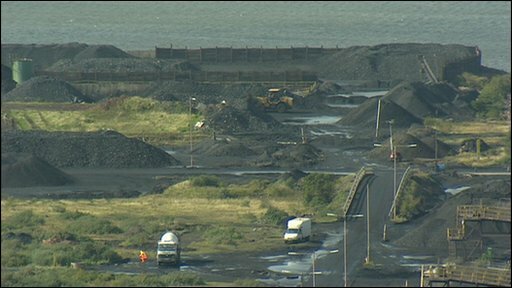 The first stage of a planning process to build a coal-fired power station in Ayrshire is to get under way on Monday. Ayrshire Power wants to build a power station with experimental carbon capture and storage (CCS) technology on a site at Hunterston near Largs. If its proposal succeeds, the plant would be the first in the UK. Environmentalists are campaigning against the plans, claiming it sends the wrong message about Scotland's energy future. CCS technology would remove carbon dioxide produced by the coal-fired station. This would then be turned into liquid using chemicals and stored underground. Juliet Swann, head of campaigns at Friends of the Earth Scotland, said: "Carbon capture and storage is potentially a way to reach a low-carbon future. "However, the carbon benefits are not yet proven and in any case it should be demonstrated on existing plants first, not least so we can share the technology with the rest of the world and in doing so repay our debt to them for supplying us with so much of our dirty energy. "We are also concerned that this application is being made at a time when the inclusion of Hunterston in the national planning framework is the subject of a legal challenge. "We would suggest Ayrshire Power should undertake a full and comprehensive local and national consultation, given the implications of this development both on the local area and the national ambition to move to a clean energy future." A spokesman for campaign group Communities Opposed to New Coal at Hunterston (Conch) said the plans were a "massive con". The spokesman added: "Claims that it will be a clean power station are totally misleading. Even if carbon capture technology could be proven to work, only around 20% of the emissions are required to be 'captured' under government regulations. "We are also angry at Ayrshire Power's failure to consult with local people on their plans." The proposals, drawn up by energy company Ayrshire Power, owned by Peel Energy Ltd, are for a site between the existing Clydeport coal handling facility at the Hunterston Terminal, and the Hunterston B nuclear power plant. The plans will be formally submitted to the Scottish Government's Energy Consents Unit on Monday. It will then enter a "gate checking" phase while the government ensures all the information needed for a full assessment of the proposals is included, before being put forward for public consultation. The company said it would "use highly efficient modern technology with strict emissions control", with 90% of carbon from the plant being captured, and reducing coal consumption by up to 25%. If approved, the new facility could meet the energy needs of three million homes, Ayrshire power said. It also claimed that the new power station would generate a "significant" number of jobs in the area, with up to 1,600 people being employed during construction and 160 permanent jobs when the power station is running. Labour hit out at the plans, with its energy spokesman Lewis Macdonald saying: "If Scotland is going to make a significant contribution to cutting carbon emissions, it makes no sense to start by building a coal-fired power station in place of nuclear electricity. "If this goes ahead it will set back Scotland's prospects of meeting our commitment on climate change."